These days, picking up a newspaper and glancing at the headlines can be a jarring experience. The nation is at war. A daring rescue of a courageous 19-year-old female POW succeeded. A great journalist serving as a Washington Post columnist and Atlantic Monthly editor-at-large was tragically killed while on assignment in Iraq. Coalition forces have entered the "heart of Baghdad." One of my senators would like to overthrow my president. The last refers to the controversy surrounding recent comments by Sen. John Kerry (D-MA), who has emerged as a leading contender for his party's 2004 presidential nomination. He decided to rally the voters assembled to hear him speak at a public library in New Hampshire by calling for "regime change" here in the United States: "What we need now is not just regime change in Saddam Hussein and Iraq, but we need a regime change in the United States." 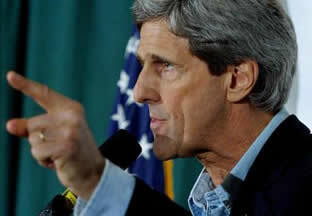 Lo and behold, a tidal wave of denunciation washed over Sen. Kerry. The top three Republican congressional leaders  Senate Majority Leader Bill Frist (R-TN), House Speaker Dennis Hastert (R-Ill.) and House Majority Leader Tom DeLay (R-Tex.)  issued statements denouncing his comment and accusing him of putting partisan politics ahead of support for our troops. "America before New Hampshire" was DeLay's pithy exhortation for the senator to drop these kinds of remarks. Kerry has been working overtime to put himself into an unassailable position on Iraq. He voted for the war resolution authorizing President Bush to use force and has repeatedly indicated that he is willing to back military intervention if necessary. At the same time, he has criticized the president's diplomacy and set conditions for his support that have not been met. He is the most concrete political  as opposed to pundit  manifestation of the phenomena of Fair Weather Hawks, to borrow the term Jeremy Lott coined in The American Prowler: War with Iraq would be practical and just, if only he were in charge. Initially, this strategy for the most part appeared to be working. A December 2002 Associated Press story portrayed Kerry as an Iraq hawk. In an article for The American Prospect, Harold Meyerson described him as a "tough dove." He was well positioned to claim that he had been on board all along and that he had been a prescient critic of the administration's actions, depending on how the Iraq war ended up being perceived by the electorate. Yet Kerry did not account for the depth of antiwar  and perhaps more precisely, anti-Bush  sentiment among activists and special interest groups that comprise so much of the Democratic Party's liberal base. Some began to criticize his vote for the war resolution. Soon he felt the tug of Sen. Joseph Lieberman (D-CT) on his right, courting centrist voters concerned about national security, and the rising antiwar candidacy of former Vermont Gov. Howard Dean, another neighbor to New Hampshire, on his left. Consequently, he has stepped up his criticism of Bush to compete with Dean and galvanize his base. This led to his unfortunate "regime change" comment. While I consider his remark to be in extremely poor taste  especially as part of a prepared speech, as one longtime reader pointed out in an email conversation  I am not as outraged by it as many of my compatriots on the right. It was an entirely predictable quip, albeit one that would have been better for someone other than the candidate himself to make. It doesn't necessarily indicate a belief in moral equivalency between Saddam Hussein and President Bush. The simple fact that Kerry is running for president ought to strongly suggest that he would like to see Bush and the current administration replaced; he is attempting to effect this change through the ballot box, not by placing a call to Tony Blair to enlist his military support for U.S. "regime change." I am far more put off by Kerry's response to those who criticize him for making the "regime change" comment. "The Republicans have tried to make a practice of attacking anybody who speaks out strongly by questioning their patriotism," he told the Associated Press in a telephone interview last week. "I refuse to have my patriotism or right to speak out questioned. I fought for and earned the right to express my views in this country." Now, some Republicans do in fact have a tendency to argue that criticism of either the war or the president is unpatriotic. Most people, and probably most Republicans, recognize that this is not intrinsically the case. But many liberal Democrats have come up with an equally obnoxious debating tactic: to claim that any disagreement with them, whether over style or substance, amounts to questioning their patriotism. If they take a position on Iraq, terrorism or homeland security, they equate criticism of that position with a personal attack on their national loyalty. In addition to resorting to this tactic, Kerry attempts to dismiss criticism on the grounds that he is a decorated Vietnam War veteran. No one disputes that his service record was admirable, but it does not inoculate him against all criticism of everything he does for the remainder of his time in public life. He does not have carte blanche to make ill-advised comments  or take imprudent policy positions - without anyone calling him on it. Kerry was willing to support Bill Clinton against World War II heroes George Bush (41) and Bob Dole. When Clinton intervened militarily in Haiti and Kosovo, among other places, Kerry strongly supported him despite his lack of military service. If a president who never served can commit our troops to battle, what is wrong with a Republican congressman who never served criticizing a public statement by the senator? Kerry's  possibly unintentional  insinuation that he has specially "earned the right" to express his views does not sit well with me. This is a right we all posses as Americans. We should be eternally grateful to the brave men and women who have made sacrifices the rest of us did not have to make in order to protect our rights, but those rights do not derive from any government and no man is in a position to judge whether we have "earned" them. They are inalienable and the Declaration of Independence clearly specifies our Creator as their source. Sen. Kerry's critics may be overheated, but he brought this mini-controversy upon himself. The editors of the New York Post had it right: He "has sure stepped in it." Now he can either wipe off his shoes and move forward or continue rubbing the mess in our faces.